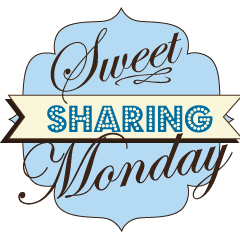 Welcome everyone again to Sweet Sharing Monday! I am really so appreciative of all of the participation I saw in the first, second, and third parties- dont forget to check out last week’s features here. I truly do enjoy looking at every link, and reading every comment. It is refreshing and truly motivating to see such wonderful creations- and THAT is what inspired Sweet Sharing Monday. I hope you tell your friends so we can all be inspired by what THEY’VE done as well! Don’t forget to Check back on Thursday to see which link was the most viewed! Hi Kayla!!! How are you sweetie? Amber recently posted..Little Baker Party! Thank you so much for hosting! I hope you’ve had a wonderful weekend! Great party chocked full of terrific ideas–thanks so much for hosting! Amy recently posted..Afternoon Quickie: Pink Polkadots! Thank you for hosting and for inviting me!!!! I’ll add you to my daily link up list and visit you on Monday to link up! !